The popular reality show Bigg Boss 12 is going strong and is just a few days away from the grand finale and the contestants are all geared up in their own actions. The previous week of the show saw a lot of nuisance in the house which was created by Surbhi Rana and Sreesanth's heated argument. Well, yet again a shocking incident has happened so much so that even physical violence has got involved in the same and this has happened between Sree and Rohit Suchanti. It is a known fact that Sreesanth has been one of the most violent and aggressive contestants in the house who gets provoked by little things and gets irritated. 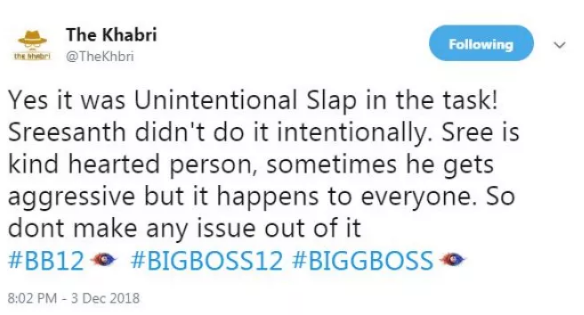 The recent event that has come to light shows Sreesanth in a violent mood so much so that he even got physical and slapped Rohit during the captaincy task. It all happened when during the task, Rohit provoked the cricketer so much so that he got up from his place and hit him. It isn't a new thing in the game as previously in Bigg Boss season 11, Priyank Sharma, during one of the tasks hit Akash Dadlani, the result of which he was thrown by the makers and Salman Khan. It will now be interesting to see that how the makers of the show will respond to this behaviour of Sree, knowing the fact that in this season he is the one who is grabbing the maximum TRPs for the show. If we talk about the captaincy task, it is called the BB School Bus in which a bus was set up along with a baggage room with bags of contestants name with some amount. When the horn will be played, the contestants will have to pick bags of the contestants whom they want to save or disqualify. Not only this, but it was also announced that the captain of the week would directly go to the semi-finale week of the show. For more news related to the show, stay tuned with us!